Wow, its been awhile! School has been pretty non-stop this last few weeks and I haven't had time to really even dress nicely, let alone get some photos. This weekend was the first little break I've had in a while, and my Mom, sister and I went to Toronto for the weekend. This dress from Blue Vanilla is pretty much everything you could want in a fall dress - bedazzled peter pan collar, awesome print, and warm sleeves. Still undecided about whether or not this hat is a purchase I'm going to get a lot of use out of, but I couldn't resist! It's so nice to see you around again! This outfit is super cute and cozy! Love the collar and hat! Thanks so much Stacia! I hope I can keep up posting a bit better now, haha. I am always a fan of a collared dress! Beautiful look! You look wonderful and I love the print on that dress! It is so funny, nowadays, I see new clothing and it looks like a vintage piece! It's hard to tell anymore - unless of course you see the tag and material. Great find with that hat! 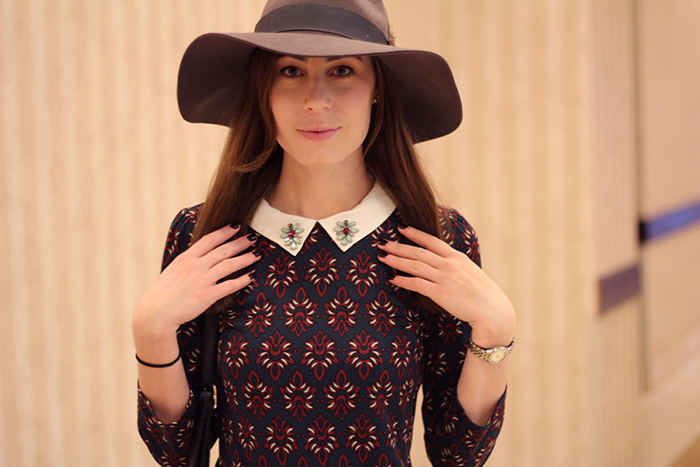 haha I think the peter pan collar definitely looks vintage on pretty much anything. Thanks so much! I love the little jeweled detail on the color of the dress. Chic!